There’s an old saying that good things come in small packages. But, for many years, professional photographers have had to settle for bulky bodies and heavy lenses to get the shots that they desired. Luckily for us, shifts in imaging technology have allowed us to make stellar shots with increasingly smaller, compact cameras. While you may think of a simple point and shoot when hearing the phrase “compact camera”, many of the models out there offer the best the industry has to offer. One of the many aspects modern photographers enjoy is the implementation of touchscreen technology. Rather than fiddling with buttons, it’s now possible to make adjustments with just single touch. With touchscreens available on compact cameras of all shapes and sizes, here are a few of the best options out there for photographers. Dimensions: 3.0 x 4.4 x 1.7 in, 13.3 oz. Canon has a lot to offer when it comes to the compact camera. Among the most tempting of those options the company has to offer has to be the Canon G5X. Though there are a couple newer releases in the Powershot G series, the G5X has aged well and still manages to provide just about anything a serious photographer could want. Among its many bragging points is its highly sensitive 20.2 MP BSI-CMOS sensor. It excels in low-light situation and is capable of capturing 1080p HD video at up to 60 fps. With it’s DIGIC 6 processor, it consistently delivers excellent image quality and is capable of recording RAW files. This ensures maximum dynamic range and detail in each and every shot. The G5X also boasts a 3″ fully articulating touchscreen LCD panel. Composed of 1.04 million dots, it provides an ultra clear view, making it easy to hone in on the finest details of a shot. Additionally, the screen can be flipped inwards for extra protection. For situations in which an LCD viewer is less than ideal, the camera also includes a handy viewfinder that drastically saves camera battery life. The G5X also retains physical buttons for photographers not fond of sifting through touchscreen menus and settings. Dimensions: 2.5 x 1.3 x 4.3 in, 13.4 oz. For over two decades, Nikon has been experimenting with the formula for the perfect compact camera. Thus far, the Nikon 1 V3 ranks among the best the imaging giant has put forth. The flagship release of the 1-line, it’s a camera featuring minimum lag, high accuracy, and maximum detail. Its 18.4MP CMOS sensor can reach ISOs upwards of 12800. This makes it an excellent choice for image makers accustomed to working with very little light. At the time of this model’s release, its 4A image processor enabled the fastest continuous shooting available in a camera – period. With the ability to produce high quality RAW files and a solid build, the feel of this camera is very much reminiscent of a professional grade DSLR. Users describe the camera’s 3″ tilting touchscreen LCD as “sturdy and strong”. With 2.3 million dots used to generate images, it has a slight leg up on its main competitor, Canon. Among the benefits provided by the addition of the monitor are 171 individual contrast detection AF points. With the touch of a finger, it’s possible to choose a focal point through the screen itself. But, if an LCD panel isn’t quite your cup of tea, have no fear. Nikon also offers an optional electronic viewfinder for those accustomed to doing things the old fashioned way. Dimensions: 2.1 x 2.8 x 1.5 in, 14.5 oz. Lately, Sony has been making strides in the emerging mirror-less camera market. The A6500 is no exception, offering the latest in greatest in mirror-less technology. With a massive 24.2 MP CMOS sensor, it packs a punch powerful enough to satiate the needs of any pro-level DSLR user. And, like a DSLR, the A6500 allows for the placement of interchangeable lenses. This is an option many compact cameras lack. Yet, it still manages to retain the size and feel of a point and shoot, easily able to fit in a pocket or purse. All the while, it’s capable of capturing crystal clear 4K ultra HD video footage despite its humble appearance. In many ways, the A6500 is comparable to its predecessor, the A6300. But, one of the biggest changes implemented has to be the camera’s fixed 2.9″ LCD touchscreen. Among other things, it allows users to shift focus smoothly. With 425 phase detection points, it’s able to auto-focus in fractions of a second anywhere within a photograph’s composition. Dimensions: 3.3 x 1.7 x 4.8 in., 16.5 oz. Another impressive mirror-less, the Olympus E-M5 II is among the best compact cameras available. With a 16 MP CMOS sensor installed, it’s able to process RAW imagery and works well in low-lighting situations, attaining ISOs as high as 25,600. It’s durable, with a handsome weather-sealed magnesium alloy body. It projects a level of professionalism not seen in any old run-of-the-mill point and shoot. What’s more, like the Sony A6500, the Olympus has a lens mount, providing increased flexibility in the image making process. The E-M5 II features a vari-angle LCD touchscreen composed of 1.03 million dots. Equipped with an incredibly intuitive user interface, the camera makes it incredibly easy to capture images and video in a variety of aspect ratios. With use of the touchscreen, it’s even possible to shift focal points while simultaneously recording high definition 1080p footage. But, for situation where the LCD panel just won’t cut it, the camera also includes a high resolution electronic viewfinder. Dimensions: 4.4 x 1.7 x 2.5 in., 12 oz. When it comes to Fujifilm’s X70 camera, there’s plenty to gawk over. Its fixed lens is one of the most impressive around – at a versatile 18.5mm, it can reach apertures as wide as f/2.8! With its built in electronic shutter, it can also stop time in its tracks with shutter speeds as fast as 1/32000th of a second. Though it’s X-Trans CMOS II sensor packs just 16.3 MP, it’s capable of capturing high resolution images normally. This was once only attainable with larger sensors. Now, thanks to the state of the art technology it’s all included. The X70 is the first in Fuji’s X-series to come equipped with a touchscreen monitor. Smartphone users in particular should have no problem adjusting to this camera. The Fuji utilizes many of the gestures we’re already familiar with – navigating is as easy as swiping between photographs and pinching to zoom in on details. The LCD is also capable of flipping upward at a 180 degree angle. Aside from being helpful when it comes to photographing odd angles, it’s the perfect feature for taking top-notch selfies. 3.0-inch 1.04 million-dot 180 degree tilting touchscreen LCD. Operating Temperature : 0°C - 40°C (+32°F - +104°F). Six types of High-Speed / High-Precision AF Modes. No camera Bag. Dimensions: 1.7 x 4.4 x 2.5 in., 11 oz. One of the Panasonic ZS100‘s most cherished features is its 4K UHD video footage equipped with the innovative ability to choose focal points in post processing. But the Panasonic imaging technology doesn’t end there. It’s possible to takes the Panasonic’s 4K footage and extract 4K stills in a flash. The camera’s 20 MP sensor contains minimal artifacting, and the Venus Engine image processor provides the most colorful pictures listed among these top notch compact cameras. The fixed Leica lens features a control ring mounted in place. This provides an experience reminiscent to fiddling with a DSLR. Aside from providing a range of 25-250mm, it also contains tilt correction and axis control technologies. 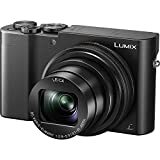 Like many of the compact cameras on our list, the Panasonic provides an electronic viewfinder capable of performing in most any situation. But, also included is a 3″ fixed touchscreen LCD. Praised for its clarity and its ability to capture details, the monitor plays a crucial role in allowing users to see everything a picture has to offer. Dimensions: 2.5 x 1.6 x 4.7 in., 10 oz. 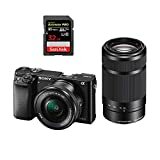 Physically, the Samsung NX500 stands out among other high end compact cameras – with a flashier design, it’s not quite as discreet as its competition. However, in this little 10 ounce camera, there’s a lot worth boasting about. Despite its small size, it’s equipped with a whopping 28MP APS/C sensor. Utilizing backside illumination technology, it offers the most usable light possible to produce a rich end product regardless of lighting conditions. As a testament to its outstanding capabilities, the NX500 can go all the way up to ISO 51200. Like many of the cameras on our list, the Samsung can capture 4K UHD video footage. But unlike the competition, it utilizes HEVC technology to only use up half the space a standard recording would require. It should come as no surprise that Samsung has invested some fancy technology into its touchscreen. A 3″ VGA AMOLED monitor, it’s capable of tilting at a 90 degree angle and rotating up to 180 degrees. This means that in virtually any scenario, it’s easy to get a view of what’s going on. What’s more, despite the advanced technical innovations employed by this camera, it’s easy enough to understand. Impressive UI makes it simple enough to activate menus and control every aspect of your image in camera. New 28MP Back Side Illuminated APS-C Sensor. Dimensions: 3.6 x 3.1 5.1 in., 20.8 oz. It’s easy to get turned off by the Leica Q‘s hefty price tag. As the heaviest and thickest camera on our list, it’s also the camera that most straddles the line of being considered a compact camera. However, there’s a good reason that the Q is included among the best compact cameras and manages to sell among photo aficionados. For those looking for everything they could possibly want in a single body and a single lens, the Leica is worthy of consideration. Unlike the average point and shoot, the Q boasts a full-frame 24.4MP CMOS sensor, providing quality reproductions. The legendary Leica glass is an f/1.7 lens, an unheard of feat for a compact camera. With these two aspects combined, the Q produces pictures as close to perfect as possible. A 3″ fixed touchscreen tops off the camera’s aluminum and magnesium alloy body . For the most part, it’s simple. Aside from providing a live view of its surroundings, the LCD also allows access to features such as contrast detecting auto-focus. The interface is simple – but make no mistake in thinking that this is a flaw on Leica’s part. Rather, almost all of the camera’s controls can be accessed by maneuvering the lens. It’s hard to take a bad picture with a Leica, and the LCD included serves as a guide rather than a complete control panel. Note: Last Amazon.com Price Update: 2019-04-18 | Refer to our Affiliate Disclosure and Disclaimer. A photographer turned writer based out of Boston, MA, Meghan is an ambitious individual whose work has been featured in a number of gallery exhibitions and art publications. GuruShots Review: Truly the World’s Great Photography Game?